We are presenting an installation in downtown Urbana that puts performances in the context of visual art, allowing the audience to walk around and experience works in relationship to each other. Alongside choreographers Laura Chiaramonte, Shannon Stewart, Hadley Smith; musicians Whitney Ashe, Melody Chua, Jing Chen, and visual artist Jess-Kiel Wornson, we will play Nomi Epstein’s work Mandolin, Guitar, Harp at intervals throughout the 3-hour installation. At 9pm, there will be a short, spirited concert by our Trio of works by Lainie Fefferman, Hans Werner Henze, and the Exquisite Corpse game pieces of John Cage, Henry Cowell, Lou Harrison, Virgil Thomson, and Frank Wigglesworth. And then enjoy lovely libations with wonderful people – should be a good time! This fall we will give workshops to introduce composition to children and teens in an interactive, engaging way. We will perform the Exquisite and Sonorous Corpses, a set of game pieces by John Cage, Henry Cowell, Lou Harrison, Virgil Thomson, and Frank Wigglesworth (arranged by James Moore) and then isolate bits of the pieces for students to re-arrange in their own order. We will then perform these student-made pieces for the participants to hear their compositions. The original Corpses were based on a game used by French Surrealist artist and writers where one person starts the work and conceals all or most of what they’ve drawn/written and the next artist must do the same until it is passed around to everyone. The result is a piece with strong contrasts and playful juxtapositions. 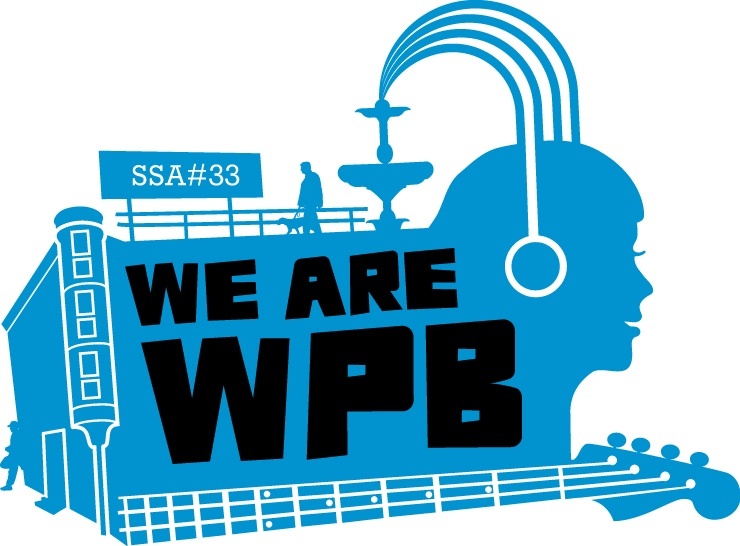 We will present the workshop to April Blacker’s 2nd grade music students and also explain the features of our instruments as part of their Arts Infusion program. As part of UFL’s Teen Open Lab, we will introduce students to the revolutionary and experimental methods of John Cage and composers of his time and perform the Exquisite Corpses, explaining how they each was made. Then students will get a chance to make their own piece and have it played by our trio. Come out, make new works, and hear them played! 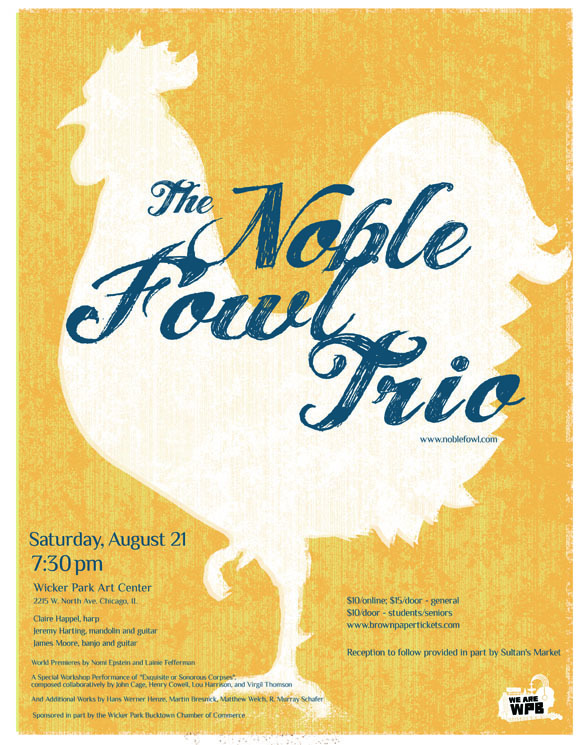 Noble Fowl Trio on WFMT’s Relevant Tones! We were featured on the radio show, Relevant Tones, broadcast through Chicago’s WFMT. The program, titled Modern Harp, presented new solo and chamber works that include harp. You can listen to the 1st movement of our recording of Hans Werner Henze’s Carillon, Recitatif, and Masque at the link below. Enjoy! We’re organizing our first evening-length concert of beautiful and unconventional works. It will include the peculiarly melodic piece that originally brought us together – Hans Werner Henze’s Carillon, Recitatif, and Masque – as well as two commissions for the ensemble, solos for each instrument, and a workshop performance of a little known collaborative work between John Cage, Virgil Thomson, Lou Harrison, and Henry Cowell. The new works being written for the trio are by Nomi Epstein and Lainie Fefferman. Nomi Epstein is a Chicago composer who writes spacious works with sounds uttering from instruments in unique ways. Lainie Fefferman, of New York, writes works that range from neo-minimalist to hard rock and has composed a piece titled Attara with much movement and idiosyncratic rhythmic placements. Both are sure to be exciting additions to the repertoire for the ensemble. Exquisite or Sonorous Corpses is a collection of miniature pieces composed collaboratively by John Cage, Henry Cowell, Lou Harrison, and Virgil Thomson in the early 1940s. The pieces were written in the style of the surrealist game of the same name: Each composer took turns writing single measures of the same composition, with little or no information about eachother’s contribution. The result is a fantastic, contorting collage of musical ideas for unspecified instrumentation. James has been researching these amazing pieces for the past four years, and has arranged a few of them for Noble Fowl as a workshop towards future realizations of the entire set. On harp, Claire will perform movements from R. Murray Schafer’s solo harp piece Crown of Ariadne – a piece in which the harpist is surrounded by percussion instruments woven throughout the piece. James will perform Gorgamor the Giant Gecko for solo banjo by Matthew Welch, a composer whose influences are spread all the way from Celtic music to Indonesian gamelan, minimalism, and rock. And finally, Jeremy will perform Martin Bresnick’s Bag O’ Tells for solo mandolin, a work which explores the music of four different cultures – the Russian Balalaika in Catacomb, the African thumb piano in Mbira, the Canzona on the Italian song style in which a repeated note begins each phrase, and the Latin American dance, La Bamba, known to all mavens of ’60s pop music.